Erick Fedde pitched shutout ball into the sixth inning and the Washington Nationals beat the fading Philadelphia Phillies 3-1 on Tuesday in the first game of a doubleheader. PHILADELPHIA (AP) — Juan Soto made a leaping catch in foul territory in the first game of a doubleheader and ended eight hours of baseball with a milestone homer in the second game. Both plays from the talented teen keyed a sensational sweep for the Nationals. 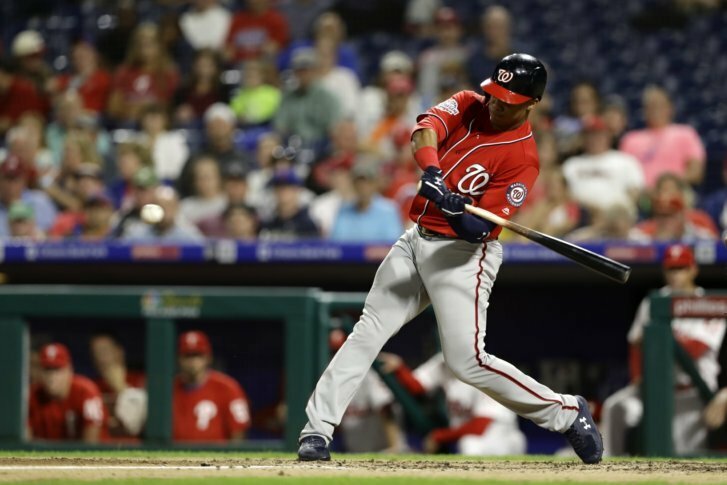 Soto hit a solo home run in the 10th inning, his second of the game, to lead the Washington Nationals to a 7-6 win over the Philadelphia Phillies and a doubleheader sweep on Tuesday night. In the first game, Spencer Kieboom hit his first major league home run after losing a tooth earlier in the day, Erick Fedde pitched shutout ball into the sixth inning and the Nationals beat Phillies 3-1. It’s the Phillies who are stuck in the mud. The Phillies, who were 15 games over .500 in early August and in the thick of NL playoff race, have lost four straight games and are 6-16 since Aug. 18. Philadelphia fell 6 ½ games behind Atlanta in the NL East and 6 ½ games behind St. Louis in the race for the second wild card spot. The Nationals (73-72) also swept a doubleheader on Saturday and just may pass the slumping Phillies (74-70) in the final standings. “I’m not going to sugarcoat it. We’re not playing good baseball right now,” Phillies manager Gabe Kapler said. The second game ended 8 1/2 hours after the first pitch in the opener — and with only a smattering of fans at the park each time. “I feel beat up right now and I just stood there,” Martinez said. The Phillies seemed poised to win the nightcap and get some sort of spark going to stay in the NL playoff picture. They scored five runs in the fourth inning off starter Tanner Roark, and Jose Bautista hit a solo shot in the eighth to make it 6-3. But Dominguez failed them and Kapler let his closer labor through 43 pitches before pulling him. With 20 active pitchers, Kapler nearly gave them all a turn during the day — except when Dominguez needed help. The Phillies loaded the bases in the ninth, but the rally was snuffed when Bautista flied out. Soto had three hits and four RBIs in the nightcap and passed Ken Griffey Jr. for fourth on the career list for homers by a teenager with 18. He also has the most multi-homer games by a teenager in baseball history with three. “Can’t wait to talk to 2-2 over there,” Roark said in the Nationals clubhouse. The Nats had reason to smile — even if Kieboom, a rookie catcher, was missing a tooth. Kieboom is waiting on veneers and lost half a temporary tooth earlier at breakfast when he bit into a baguette. The other half was stuck in his gums. He looked as if he spit out a tooth while he walked to the plate in the fifth in the opener. It was just a big spitball. He pointed to the gap as he jogged back to the dugout after the solo homer. Fedde (2-3), making his second start since he missed two months with a sore right shoulder, tossed one-hit ball through five. Phillies 3B Maikel Franco flipped over a railing and into the dugout chasing down a foul ball in the eighth inning of the nightcap. Franco left the game with a right shoulder contusion and neck soreness. The Phillies have played four doubleheaders this season, their most since 2011. They’ve played three at Citizens Bank Park since the All-Star break. It’s a doozy: Washington sends RHP Stephen Strasburg (7-7, 4.04 ERA) to the mound against RHP Aaron Nola (16-4, 2.29).